An apt idiom for the Reno/Sparks area lately – in less than a week’s time two fires raged over ~2000 acres each. It was another devastating blow to the great basin and the community that calls it “Home”. The first in the Caughlin area burned 32 homes and damaged others. Our deepest sympathies to those who lost homes, so much more painful as the fires raged before Thanksgiving, and the Christmas season. 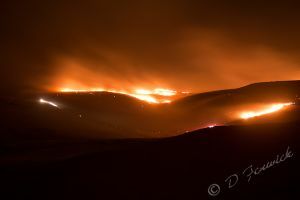 The second started East of Sparks and thankfully burned away from homes. It was stopped at 2400 acres in rough terrain. Here is a picture of the second fire. Such beauty, but so devastating. This entry was posted in Photos and tagged fire, Nevada, NV, range fire, Sparks, wildfire.